What's the worst concept car of all time? Surfing through the flood of sparkly new concept vehicles from the Frankfurt Motor Show reminds me of how many such vehicles emerge to raucous head-scratching. What is the worst concept car of all time? Before Tom Gale charted the right design course for Chrysler in the 1990s, he oversaw a few wilder ideas that puzzle at best and offend at worst. 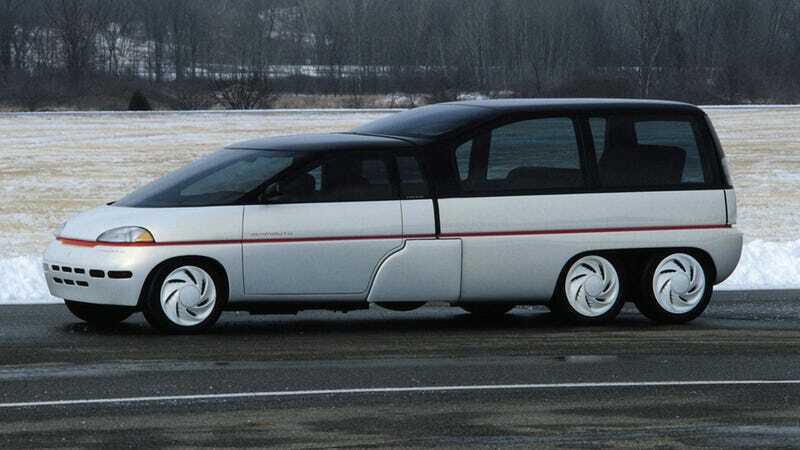 The nadir of American auto design probably rests right around the seam between the two pieces of the 1989 Plymouth Voyager III, where a three-seat minicar mated to a five-seat passenger compartment to create the nerdiest eight-seat Transformer in history. Power came from two quality Chrysler four-bangers in each pod. Because ugly spacecar.